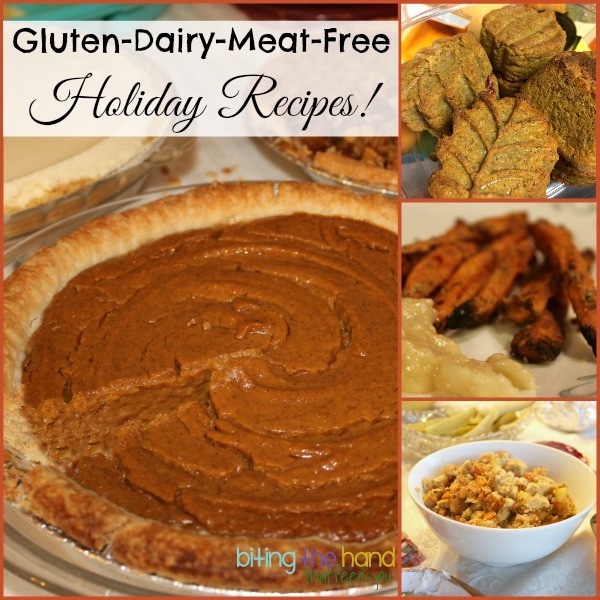 Biting The Hand That Feeds You: Gluten-Dairy-Dye-Free Vegetarian Holiday Menu! Thanks to a little planning and a plethora of saved bento bread scraps (cutting the bread before adding the fillings pays off!) the girls and I were able to have a nice gluten-dye-dairy-free Thanksgiving and Christmas! And Mama was able to go vegetarian too! Whizz bread into crumbs in a blender or food processor. Set aside. Slowly add in cooked lentils, 1/2 cup at a time, blending until smooth. If you prefer more texture, save last 1/2 cup and just pulse a few times to combine without pureeing. 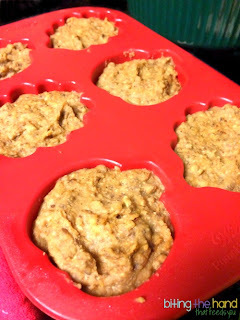 Spoon mixture into mini loaf pans or muffin pans. It still sticks a little either way, but if you're going for novelty shaped muffins, spray the muffin pan first, and try to use silicone. You can line mini loaf pans with parchment paper, if desired. 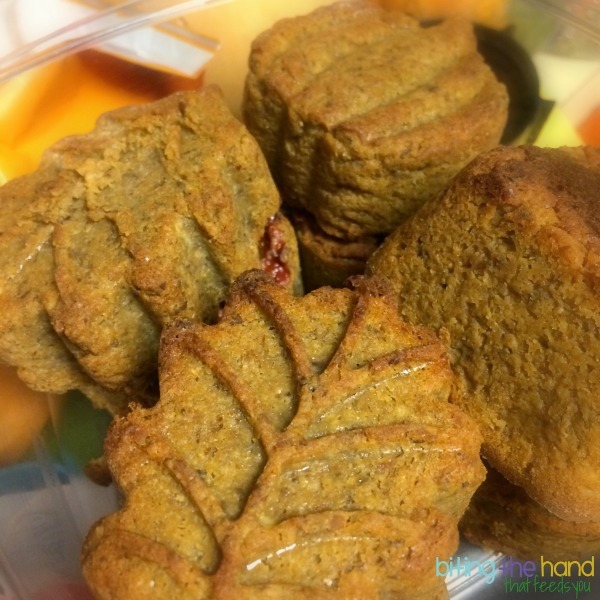 I chose an Autumn shapes muffin pan and heart muffin pan. Bake at 400 F for 35-40 minutes. Optional: add a ketchup glaze on top for the last 10 minutes of cooking. (Mix some ketchup with a little water. I eyeballed it.) It will be on the top of the muffins in the pan, so on the bottom when you flip them to show off the smooth side. But it bakes in fairly well, so isn't too messy, unless you go crazy with it. Important: Let cool before removing from pan. They will fall apart otherwise. (I made some "boring" ones to eat right away, so didn't care that they fell apart, but I let the shaped ones cool several hours before c-a-r-e-f-u-l-l-y removing from the muffin pans using a butter knife and a lot of patience to loosen the sides and peel them out of the silicone pans. Makes 3-4 mini loaves or 12-14 "muffins." Store in an airtight container in the fridge for up to one week, or longer in the freezer. The muffins fit nicely in a lunch, and even taste good cold! Place torn bread onto baking sheets in a single layer and bake for 5-7 minutes, until toasted. Fry the onion, celery, carrots, mushrooms (if using,) and herbs in 1-2 Tbsp olive oil over medium heat, stirring occasionally, until onions start turning translucent, roughly 2 minutes. Remove from heat. 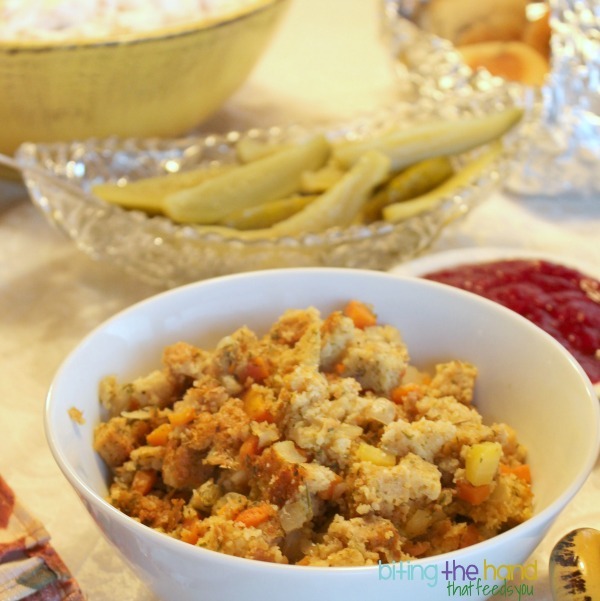 In a large bowl, combine the toasted bread bits with the cooked vegetables. Pour 6 Tbsp melted non-dairy butter over the top and mix well. Add 1 cup of broth and mix. You want bread mixture to be moist but not soggy. If needed, add more broth, 1/4 cup at a time. Transfer mixture to a baking dish and bake for about 20 minutes. 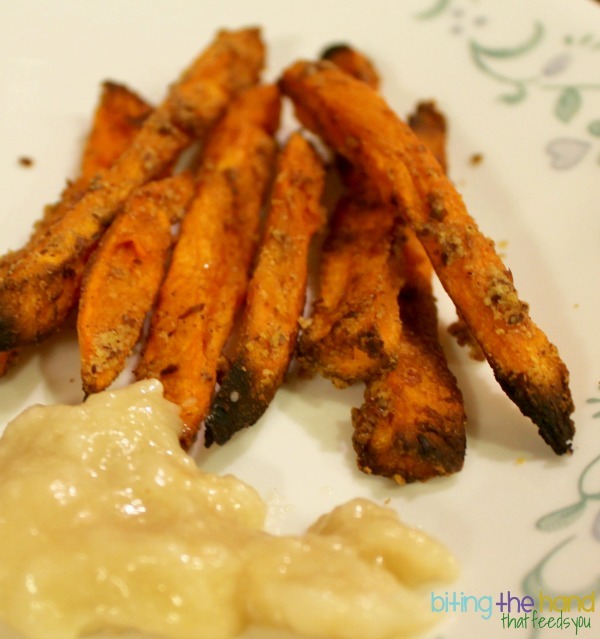 Sweet Potato Fries with Marshmallow Dip! Preheat oven to 350 or 475, depending on what else you need to cook and how much time you have. Coat 1-2 baking sheets in aluminum foil. Peel and cut sweet potatoes into fries, trying to keep them roughly the same thickness. Combine almond meal, cinnamon, garlic powder, salt, and sugar in a small bowl and set aside. Toss fries in olive or melted coconut oil and coat evenly with almond meal mixture. Lay evenly across prepared baking sheets. 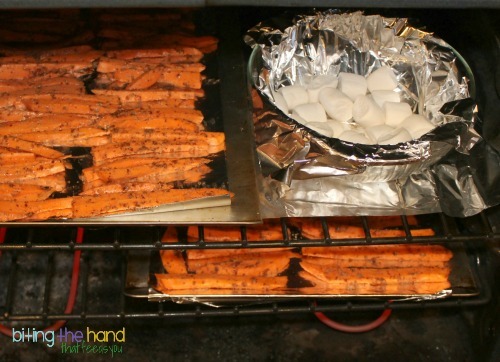 Bake 45 minutes at 350 F, or 25-30 minutes at 475 F.
Put the pan of marshmallows in the oven with the sweet potatoes and bake until puffed and toasty. The darker you go, the toastier the flavor. 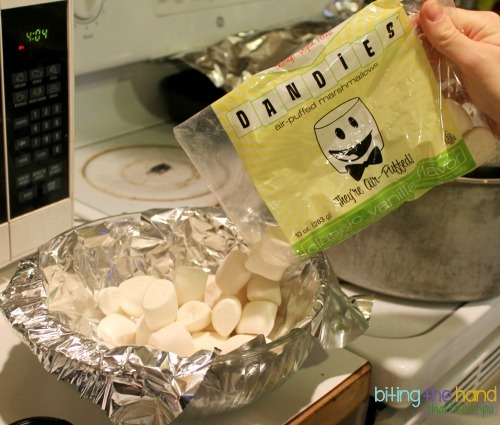 Scrape as much marshmallow as you can into a blender and add 1/2 cup of the cream from the can of coconut milk (when chilled, it separates from the coconut water. Feel free to save the water to add to smoothies or just to drink... people pay good money for that stuff! You can add any extra coconut cream to smoothies as well.) Blend well. Add more cream or a little coconut water if needed to thin out the sauce. Serve while hot. Yum! These got gobbled down by the adults before the kids even had a chance to really try them! Ha! 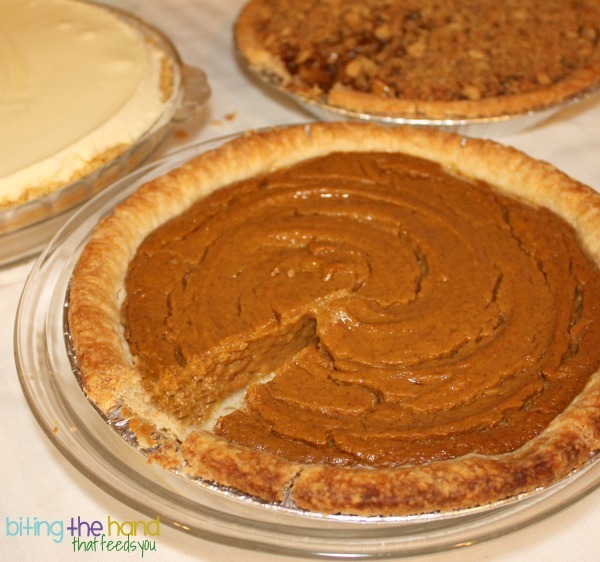 For dessert, I followed this recipe for "Silky Tofu" Pumpkin Pie. But instead of canned, I used homemade organic pumpkin puree from sugar pumpkins that came in our weekly farm share! I didn't have the mental energy to make puree AND pie filling AND a crust, so I just bought a frozen gluten-free vegan crust. Thank goodness for the gluten-free grocery near Nana's house! Although you could use Pillsbury's new gluten-free pie crust dough, found in the refrigerated dough section of the grocery store!